Shaadis in India have always been inspired by Bollywood. If it’s an Indian wedding, there’s got to be Bollywood songs. The ceremony feels kinda incomplete it its absence. There are uncountable numbers of song from the Indian film industry dedicated to different ceremonies involved in a wedding. But hang on! In the excitement of the wedding there are at times people make the wrong song selection and make the environment uncomfortable. Therefore, be aware over your selection. Understand the emotion behind a ceremony and compliment it with a song. We have hence come up with the list evergreen and must-have wedding songs from Bollywood that has been ruling wedding since 100 years of cinema. The top Best Indian Wedding Songs to make you fall in love with every moment and every ceremony of the wedding. Indian weddings known for their prompt and gander have in fact every element of fun added to it when it comes to the mehndi ceremony. Bollywood movies made over the years have complimented various melodies dedicated specially to this function. Click on the best selected Mehndi Songs from Bollywood to enjoy the occasion. Dance, music and drama make every Indian wedding complete. As such the sangeet ceremony is entirely dedicated to dance, music, fun and merry making. Be it emotional, romantic, item numbers or happy-to-get-married songs, you can combine them all and make a theme. Groove on some of the top ever green wedding sangeet songs from the list here. The fun filled tradition in an Indian wedding in the Baraat ceremony. The songs played during this wedding procession are full of high energy. As the groom sits on the horse, those rests tap their feet on awesome Bollywood dance numbers. Enjoy these wonderfully Best Bollywood Baraat entrance songs and have fun. The best part of an Indian wedding is the entrance of the bride. As she makes her way with her bridesmaid towards her bridegroom and sits beside him for the marriage rituals, play these songs on Indian Bridal Entrance and create the perfect aura. The exchange of garlands (jaimala) with sacred enchantments by the priest in front of the altar wraps up the wedding progression. The bride accepts the groom as her husband and bingo! They are married for lifetime. To compliment this auspicious occasion, here are some of the best songs for Jaimala. Play romantic wedding songs for the couple to make them feel special and add certain amount of cuteness to the whole environment. Click for some of the most amazing Bollywood romantic wedding songs to compliment the couple. Wish them lifetime happiness with these songs. Teasing wedding songs ease down the tension and help fade away those last moment wedding jitters. The teasing ceremony is something you should not miss. Enjoy these teasing wedding songs and make the whole environment lighter and merrier. Get their feet tapping on the ground. Bollywood have composed various songs dedicate to bidaai. Play this soulful list of Bollywood Bidaai Songs to compliment the occasion. It will evoke the right kind of emotions as the parents will be seen dabbing at their eyes during the heart numbing adieu. Indian weddings are known for their prompt and gander. They have in fact every element of fun added to it. When it comes to the mehndi ceremony, music becomes an indispensible part. Indians have a special night dedicated only to henna, music, singing and dancing. They call it the ‘Mehndi night’. The ceremony acts as a get together of all the family members to fun and frolic. During the function, family members apply henna to bride. 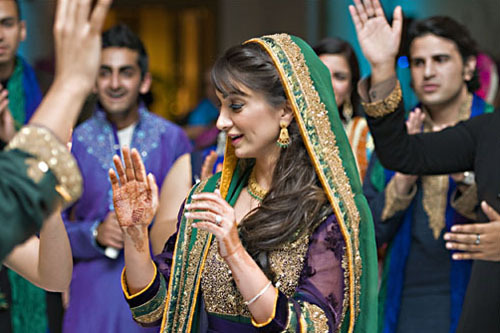 A lot of Bollywood movies have been made over the years that include scene related to Henna events. It has also come up with various melodies dedicated specially to this function. We have complied some of the best selected Mehndi Songs from Bollywood that will make you shake up right! Enjoy ! !